Britain's curry craze is described as 'A spicy 200-year affair ' and day by day this love affair with curry is heating up sensationally!!! 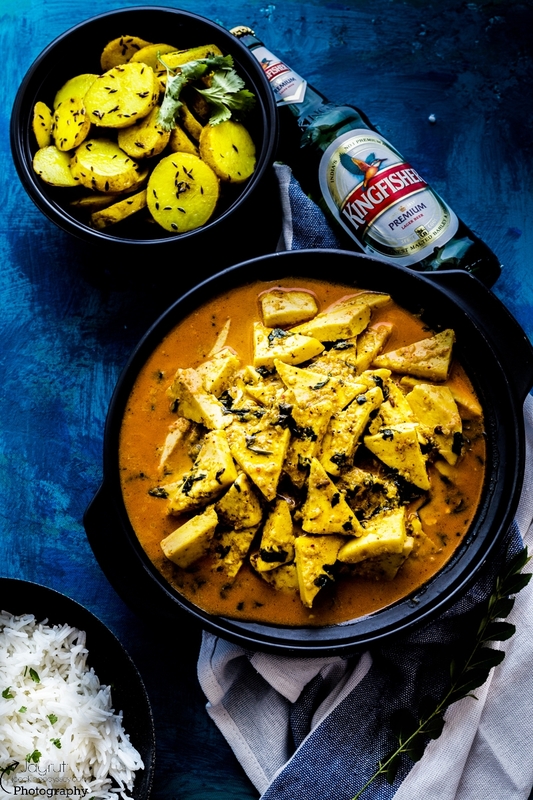 Brits love curries with their intoxicating spice and complex flavours. The industry of Curry houses in the UK has a long history, the first man of curry Mr Sake Dean Mohamet from Bihar, India opened a first curry house in Britain in London's west end, and 200 years later curry took off so well that it is claimed to be Britain's 'National Dish' ! Brits' bond with Indian food has taken so well, and people love Curry more than any other country in Europe. 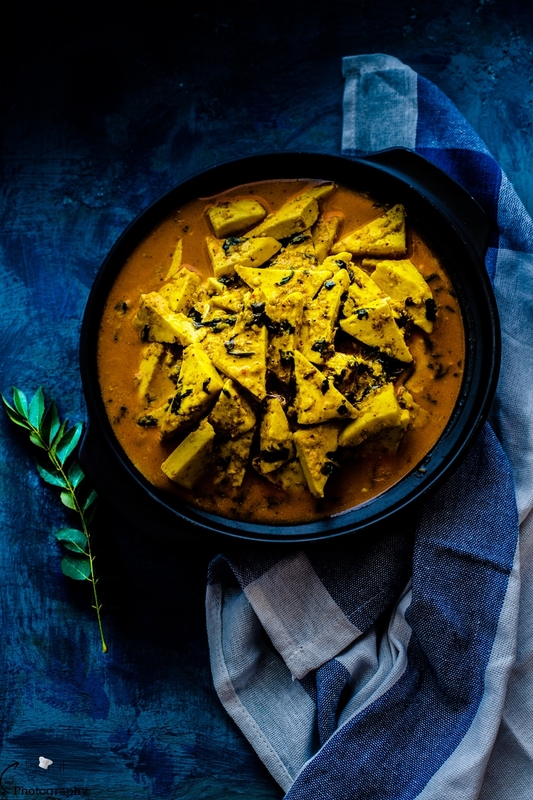 National Curry Week is asking all curry enthusiasts to support National curry week and their charity, urging them to support this event by make it or fake it curry from scratch. 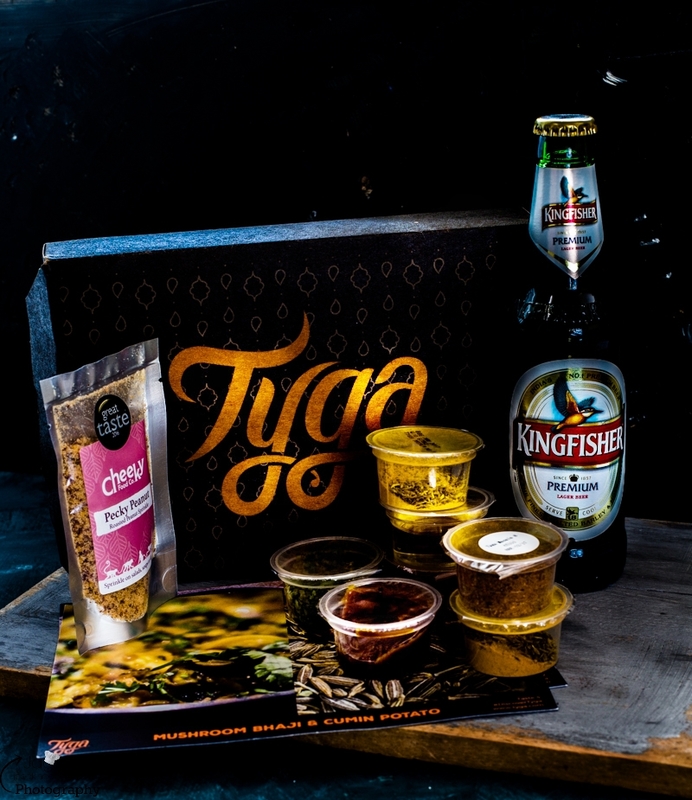 So, to mark 19th National Curry Week 2016 ( 10-16th October ) one of their official media partner Kingfisher Beer teamed up with Tyga and sent me a generous package containing a case of Kingfisher Beer Kingfisher Beer, Tyga Indian Meal Kit and Cheekyfoodcompany Sprinkle to cook a tasty, easy and traditional curry at home by using their products. and easy to follow mouthwatering and delicious recipe cards, you just need fresh few ingredients and voila...finger licking curries are ready on your dining table with out any trouble ! The kit which I received contained spices and paste for Lamb Dhansak , Chicken Chettinad, Mushroom Bhaji, Cumin Potatoes. 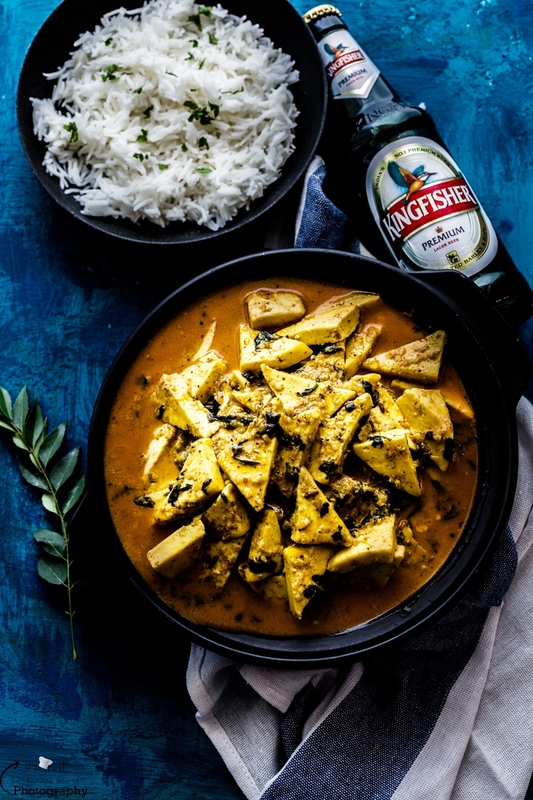 Obviously, Kingfisher Beer is a perfect pair to curry, because chilled and crisp beer can embrace a range of curries and certainly beer offers more complex flavours and aromas that go so wonderfully with all things spicy. 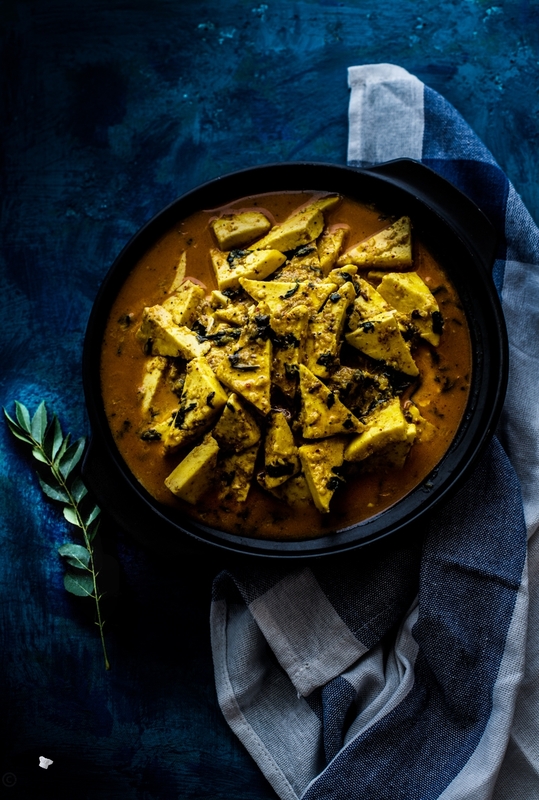 Curry and chilled bear is as synonymous as fish and chips. 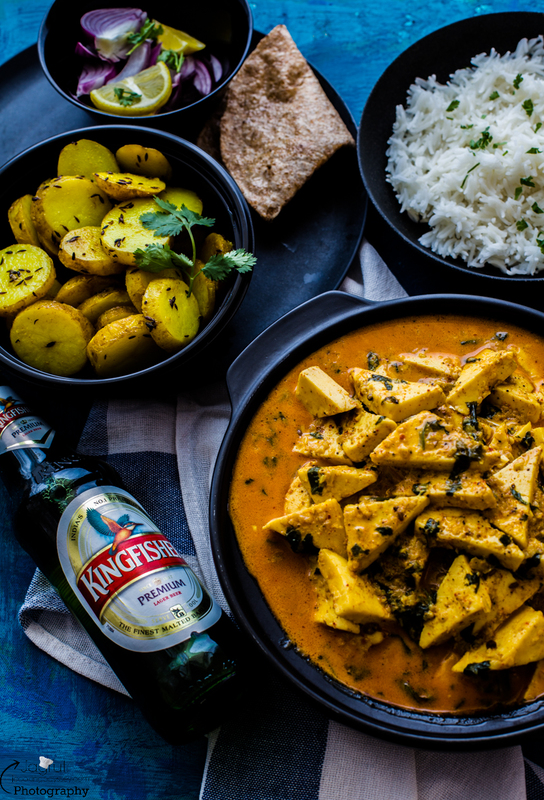 Friends, a curry and a bottle of chilled beer is perfect way to have good times! 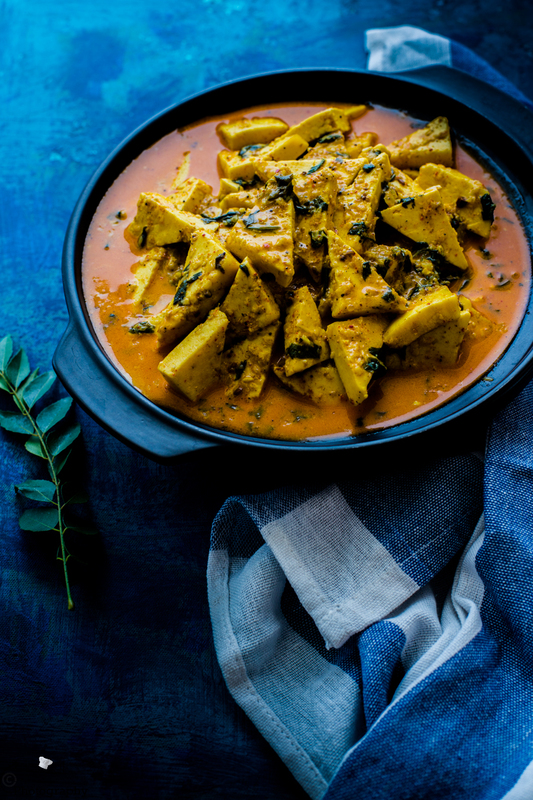 So to celebrate National Curry Week, I have prepared a typical South Indian Paneer Chettinad and Cumin Potatoes as me and my family are vegetarian. Both dishes turned out super delicious and flavourful. In a large bowl add the Paneer cubes, Tyga Masala No 8, yogurt and 1 tbsp. oil and mix well. Marinate the paneer for minimum 30 minutes. Heat oil in a heavy bottom pan or kadai, add ginger and garlic paste then add onion and fry on a high heat. Add good pinch of salt, Tyga Masala No 6 and curry leaves from the sachet. Stir in 3 minutes. Add Tyga Masala No 3 and the Kashmiri chilli ( 1/2 tsp mild, 1 tsp. medium , 2tsp. hot ) and stir for 30 seconds. Add 50 ml water to insure the mixture doesn't stick and stir for 2 minutes. Add the marinated Paneer cubes and cook uncovered on a high heat for 3 minutes. Stir in coconut milk and 1 tbsp. honey and cover for 1 minute. Uncover, stir well and serve with Rice, Roti and Salad. 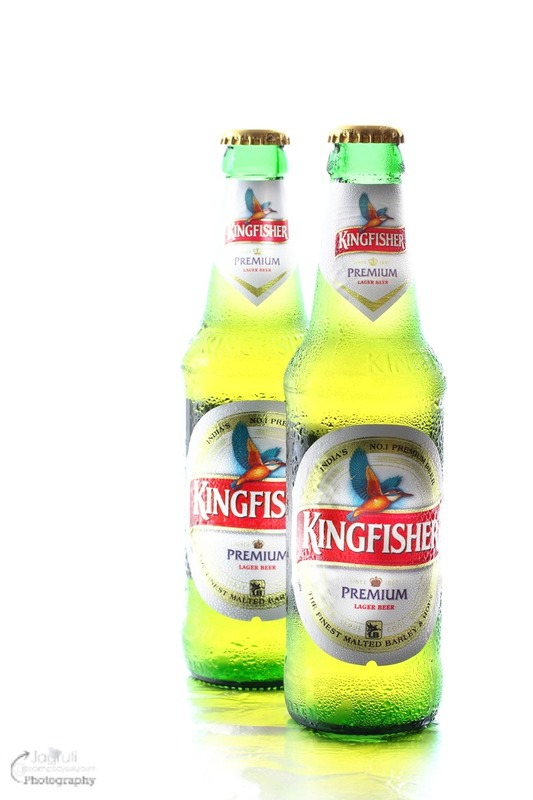 Disclaimer :- Thank you Kingfisher Beer and Tyga for sending me your products for review. I was not told or paid to write a positive review, all opinions are my own. This looks gorgeous, I love a good curry! I love curries!!! This looks really good. I'll definitely have to try this one! Ive been obsessing over curries lately.... I can't wait to give this one a try. Its making my mouth water just looking at all of your lovely photos! I have never tried a curry with Indian cottage cheese. Sounds interesting!